Unobtrusive, outdoor-rated, digitally steerable arrays from Renkus-Heinz have been installed as part of a high-end AV system for movie nights, corporate messages, and meetings at PayPal HQ. 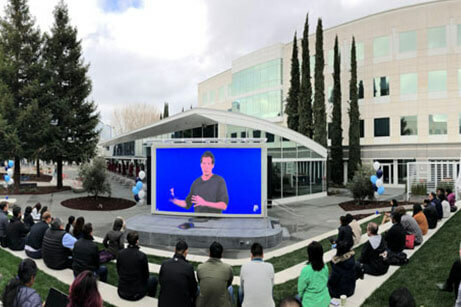 PayPal has recently added an outdoor meeting space with full AV capabilities to its company headquarters in San Jose, California. Conference Technologies, Inc., was the contractor and installer for the new system. Headquartered in St. Louis, Missouri, with multiple offices throughout the US, CTI has a long relationship with PayPal, designing and installing systems in more than 600 PayPal conference rooms throughout North America. Keller specified a Dante network employing a pair of weatherproof Renkus-Heinz IC Live Gen5-series ICL-F-DUAL-RD digitally steerable line arrays. The arrays were paired with two Renkus-Heinz PN212-SUB dual 12-inch powered subwoofers and were installed on either side of a 16ft x 10ft Planar CLO Series outdoor-rated LED video wall to create a high-end AV system for movie nights, corporate messages, and meetings. Each ICL-F-DUAL-RD array employs five 6.5-inch cone transducers and three 1-inch compression drivers per module. Vertical opening angles can be defined for up to eight steerable beams, which can be individually aimed in software. Vertical pattern control can be steered up or down from -30˚ to +30˚, with beam control effective down to 400 Hz. Horizontal dispersion is 150° up to 3 kHz and 120° above 3 kHz. The new AV system is a central hub for PayPal; since it is implemented over an IP network, everything can be transmitted anywhere in the campus. A Biamp Tesira Server-IO AVB configurable audio DSP with a SIC-4 four channel input card, SOC-4 four channel output card, and DAN-1 Dante card manages the system, while Crestron touch screens provide user control. Digital traffic is handled by a Luxul switch. For larger productions, a Midas M32-R digital mixer with Dante expansion module can be rolled out and easily patched into the network. To meet with AV Magazine, why not Register Free here for UC EXPO 2019?